This quick guide to Jack Russell puppy training, is designed to give new owners the absolute most important action steps they need to take with a new Jack Russell pup. Avoiding mistakes now will help to guarantee you don't run into problems later in your dog's life. Remember - puppyhood is the best time to install good behaviors in your puppy, and likewise, bad behaviors that are picked up at an early age are much harder to get rid of once they become habits. It's important to establish routines from the day your puppy comes home. Creating a regular daily routine is a huge part of Jack Russell Terrier puppy training, because it helps to build you up in your puppy's mind as the "pack leader." Remember this term - it's important. You control bed time, feeding time, exercise time, play time, and training time. Not only does this help your puppy feel safer, it lets her know that she needs to do what you tell her if she wants to get any of these good things (food, play, etc.). You need to do everything you can to create "pack leader" status for yourself while your puppy is young, because from 6 months of age and up, Jack Russells start to become a lot more independent. Getting your dog to follow your lead as a puppy will make the troublesome "adolescent period" (roughly 6-12 months of age) much easier to manage. I recommend you teach your dog to "Come" right from the beginning by calling out her name and the "Come" command whenever you give her a food bowl. More details on teaching the Come command. Get the puppy used to being in a crate. This will be very useful for housetraining or when you need to leave the puppy alone at home. You can do this by feeding her meals in her crate. I go into much more detail about crate training in my Jack Russell Terrier training ebook. Get your puppy used to being on a lead. For you efforts in traininga Jack Russell puppy to be successful, you will often need to use a lead as a training tool. Also your pup will need to be comfortable ona lead before you can go for walks together. Click here for more info on this. There are a lot of problem behaviors that new Jack Russell puppy owners accidentally encourage without even thinking about it. Make sure you know what the common problems are, and how to stop them from developing. 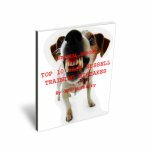 I explain how to deal with all of these problems in my ebook, The Jack Russell Lover's Ultimate Guide To Training. Socialization is a very important part of Jack Russell puppy training. This simply means meeting lots of other dogs and people while your puppy is between 8-16 weeks of age. This helps get your puppy used to being around different types of people and animals, meaning she will be more comfortable around them when she grows up. Click here to learn more about socializing your puppy. It's very important that you take a positive approach to training a Jack Russell puppy. That means no harsh punishments when your pup makes a mistake, like peeing on the floor. Remember - your pup doesn't know any better, and punishing her will only make her afraid of you. It won't solve the problem. To find out more about why punishing a pup is such a bad idea and learn how positive training can be the solution to all your behavior problems, check out my free special report, The Top Ten Jack Russell Training Mistakes. This short report will help you avoid the biggest blunders new owners often make.